More than sitting down and assuming a posture where you cross your legs and close your eyes, meditation takes on a variety of forms. If you want it to have relevance in your everyday life, it has to take on a more dynamic presence in your life. 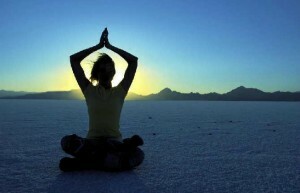 Integrating meditation in your everyday life is essential if you want to have a truly meditative lifestyle. It is no easy feat, and it will require you to make a constant choice of meditating instead of watching TV, or playing games in your computer. In other words, you have to make a deliberate choice of putting meditation in your daily life. Having presence of mind is required when it comes to meditation in your daily life. Essentially meditating at home is about paying attention. The actual meaning of ‘attention’ indicates its practice: ‘to attend upon’, ‘to be present with’. So by being attentive ‘presence of mind’ is developed. While there are degrees of attention (down to lack of attention), it can be said that there are two types: natural attention, which is ‘automated attention’ and the intentionally ‘deployed’ attention that is developed in ‘meditative attention’. When meditating, there are key areas you should focus your attention to. One is actively monitoring your body actions and movements. Another is understanding whether your feelings are pleasant, unpleasant, or merely neutral. You should likewise be aware of your mind-state—do you feel elated, calm or sad? Lastly, your mental content must also be your primary concern. In order to pay attention to all four of these, you have to constantly “home in” and get your bearings. It’s all in the consciousness: having an impression of what you’re undergoing. In order for your awareness of daily activities to deepen, you need to have continuity of attention. This is only possible by constant maintenance and finding importance in every activity that you undertake, from washing the laundry to eating lunch. To successfully embody daily meditation, you should have “triggers” all throughout the day to remind you of your daily commitment. It can be something as simple as being in contact with water—a trigger to remind you that you are supposed to be meditating, in case you forget. Often, you will find your busy schedule as an excuse for you not to meditate. But a busy lifestyle is not an excuse for you to stop meditating. Daily meditation is entirely possible, and you don’t have to be just in a sitting position when you do this.